Simple is beautiful. The unit introduced this time is located in Beverly Hills on Hong Kong Island. There is no complicated design inside, but through the interaction of colors and lines, it creates a bright and refreshing modern home. The house is the white color mainly, and the feeling of cleanness creates a refreshing living environment. In order to improve the overall layering, the sofa in the living room and the wall behind it are dark gray, and the concrete texture wall contrasts with the white dining room next to it bringing a calmness in the light feeling. 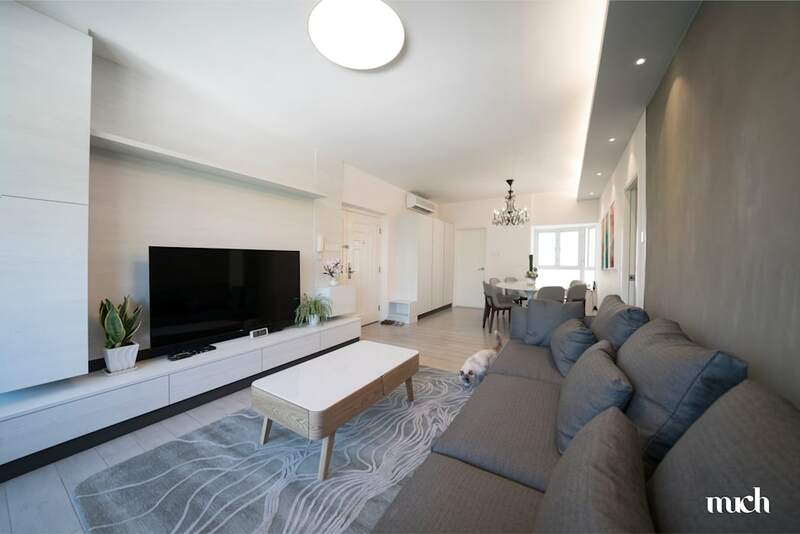 In addition to the light wooden floor, the large shoe cabinet beside to the entrance and the floor cabinet of the living room is made of white wood, and the natural pattern adds a warmth to make the whole house more lively. The designer also deliberately added dark gray to the bottom of the two cabinets, which can echo the color of the sofa and the wall and can create the feeling that the wooden cabinet is suspended in the air, reducing the pressure on the space.